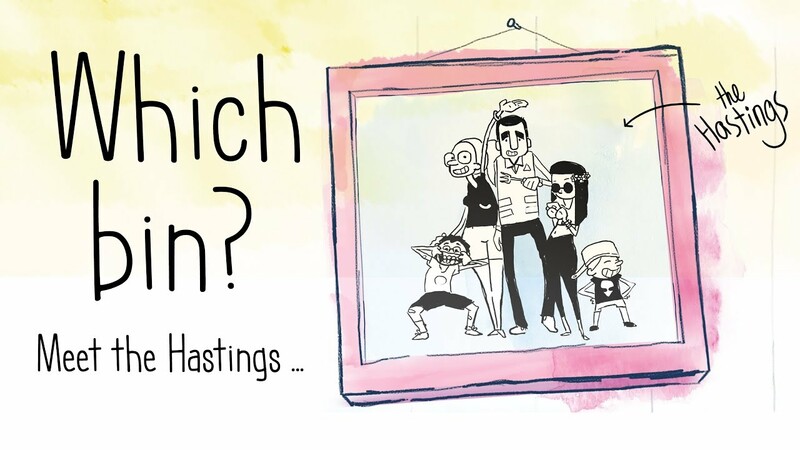 Meet the Hastings family. They'll help you with your bin service including recycling, bin collection days, damaged bins, rubbish tip locations, kerb side collections and help you choose 'Which Bin?'. Meet the Hastings Family, Harry, Lucy, Hannah, Joey and Timmy who will help you organise your household waste. Not sure 'which bin' goes out when? Find out about your bin collection days, how to put your bins out, and download the collection calendar. Find out where your nearest rubbish tip is located, the opening times and contact details. Information regarding tip fees and tip tickets is also available. Council along with the EPA will conduct a Litter campaign targeting five local litter hotspots. Not only does litter pose a major threat to the local environment & wildlife, it also costs ratepayers. Practical and simple tips to help us avoid unnecessary packaging, plastic bags, disposable utensils and food waste. Reduce plastic pollution in our oceans and how much waste we send to landfill. Impact Environmental Education has developed and delivers waste and sustainability education modules specifically tailored to the Port Macquarie-Hastings community. Report a damaged, stolen or missed bin. Order kitchen bin bags, request a new service or book kerbside collection.